Shortly after I started work on The Spider Queen, I searched on Ravelry and Google to see whether I could find any information on how knitters who had knitted this shawl had handled the borders. I found photographs of some very lovely completed Spider Queens, and several unfinished projects on Ravelry. But the most interesting finding was the blog of a woman who is fairly well known in knitting circles. Her blog includes a lot of very good technical advice, and she is quite inventive. 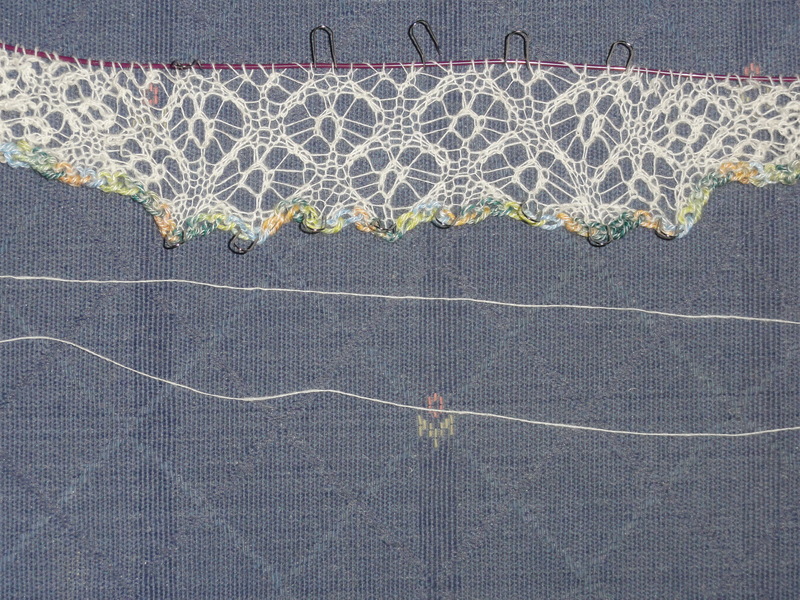 I was excited to see that she had tackled The Spider Queen back in 2007 because I thought that she had perhaps devised a way to knit the borders without having the ugly seams. Imagine my surprise when I discovered that this knitter seemed to hate this shawl. Not only did she think the border patterns were so ill-chosen that she designed her own borders using different patterns, she claimed that the instructions given by Hazel Carter, the shawl’s designer, are wrong, wrong, wrong. 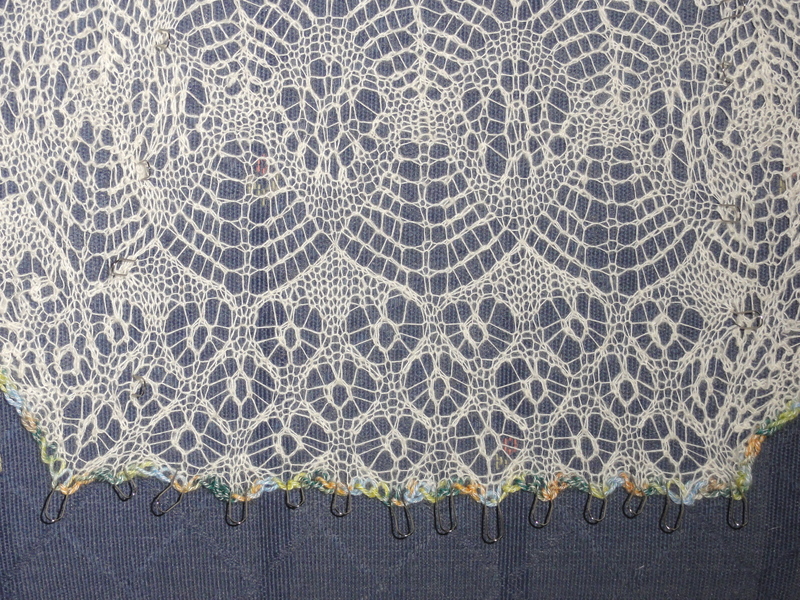 She had worked a gauge swatch using the spider pattern from the center of the shawl and following Hazel Carter’s instructions to the letter. She posted a picture of the swatch, and it looks pretty awful. The reason for this, she claims, is that she followed the instructions to always read the center chart from right to left. Now, normally a chart written for back-and-forth knitting, as opposed to knitting in the round, is read from right to left on the right-side rows and left to right on the wrong-side rows. So she knitted another swatch reading the charts in the standard way and got much better results. You can see the pictures of her two swatches by clicking here. When I found this blog entry, I was quite taken aback because I had already completed most of the first spider section of the shawl center. I had followed the instructions to always read the chart from right to left, and my results were exactly as intended. The “spider” pattern in my Spider Queen center reading the chart from right to left on every row. I don’t know where the other knitter went wrong, but it wasn’t the fault of Hazel Carter or the pattern. In fact, the pattern is totally symmetrical, and every row (except 3, 9, and 15) actually reads the same whether one goes from right to left or left to right. If a knitter failed to read the instructions carefully and missed the part where Carter says to read the center chart from right to left on every row and simply knitted the chart in the usual manner, the pattern would work just the same. I suspect the reason Carter instructs the knitter to always read the chart from right to left is because there are a couple of rows that begin and end with a single decrease (k2tog), but the pattern repeats are separated with a double decrease (sl1, k2tog, psso), so she uses a different symbol for the last stitch of the repeat. Two repeats of The Spider Queen center dry-streched. I’m very happy with how my always-right-to-left spiders look. The Spider Queen “spiders” knitted according to the designer’s directions. 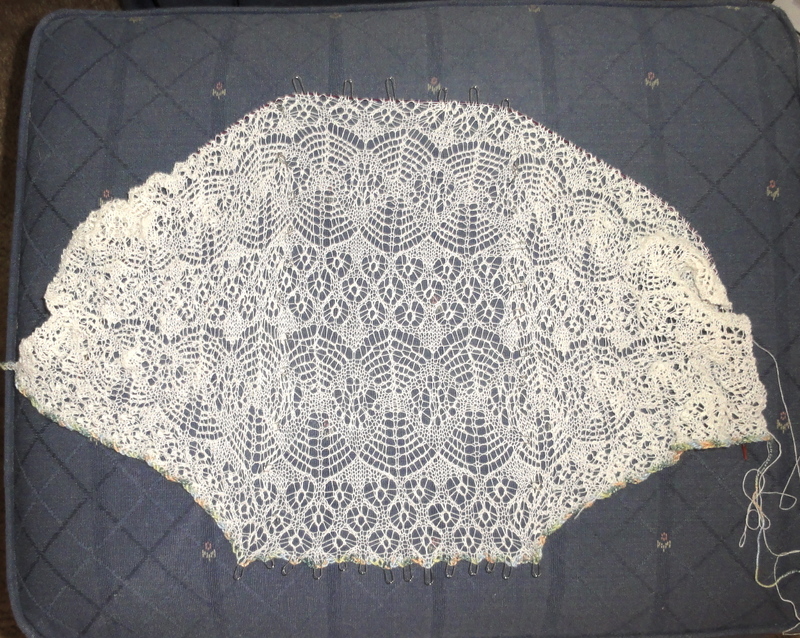 This entry was posted in Knitting, Lace Shawls and tagged Hazel Carter, Shetland Lace, The Spider Queen Shawl. Bookmark the permalink. I give you props for that kind of lace knitting. I am kind of intimidated. I feel like I am more of a bull in a china shop so delicate things scare me. I know you did this shawl a while ago but I’m so glad to have found it!! I’ve been trying to do the Spider and the way the chart looked I figured it would look the same no matter what way you read it. Thanks for mentioning this because I did see the other bloggers post as well. It’s one of those patterns that you just have to follow the directions, no matter how counter-intuitive, and just trust that it will work.